Fulton XP15 1500 lb. capacity Swivel Trailer Jack, free shipping. The industry's highest capacity swivel mount caster jack. 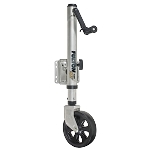 The XP15 has a 1500 pound capacity, a corrosion resistant zinc plated finish and also provides 10" of screw travel and up to 25 " of lift. The XP15 offers the industry's strongest bolt-thru swivel mount system. This new mounting system eliminates the snap ring and produces less deflection under load and during operation than other bolt thru designs. It has the Fulton patented expanded head tube design which allows for a larger, heavy duty gear set. 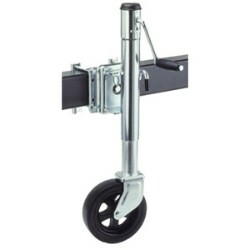 The 8" rally wheel caster and heavy duty yoke allow for easy castering under load. Mounting hardware fits up to 3" X 5" trailer tongues. Very nice product, oem replacement, bolt on and you are done, smooth operation. Great Product. It allows me to load a conventional tow behind trailer and easily move it about with one hand. I wish everything worked this well.